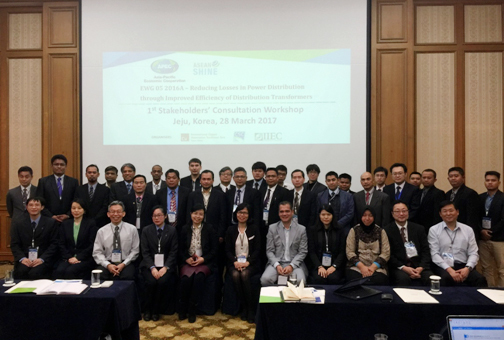 A broad range of stakeholders gathered in Jeju at a March 28 regional consultation workshop under the APEC Project: “Reducing Losses in Power Distribution through Improved Efficiency of Distribution Transformers (DTs)” (EWG 05 2016A). Participants included representatives from government agencies, electric utilities, certification and test standard organizations, the APEC Energy Working Group, and distribution transformer manufacturers in APEC economies -- including guests from non-member economies e.g., the Ministry of Industry, Myanmar and the Electricite du Laos (EdL). The workshop was organized by the China Standard Certification Company (CSC), in partnership with the International Copper Association (ICA) and IIEC. It was sponsored by the APEC Energy Efficiency Sub-fund and ICA, and co-sponsored by four APEC economies (USA, Chinese Taipei, Thailand and the Philippines). The objective of the workshop was to share country experiences and best practices in EE policies and regulations related to distribution transformers. Over the long term, the project aims to support APEC economies in the adoption of the upcoming International Electrotechnical Commission (IEC) 60076-20 technical specification, which will drive technology changes and improve distribution transformers’ energy efficiency performance. During the workshop, IIEC presented the preliminary findings of its comparative technical analysis on reducing losses through improved efficiency of distribution transformers. The workshop participants also discussed various methodologies for calculating distribution transformer efficiency, including minimum PEI (Peak Efficiency Index), maximum load and no-load losses, and minimum efficiency index at a load factor of 50%. The participants also compared existing standards with the new IEC technical specification, and discussed barriers to efficiency improvements as well as technical and institutional challenges to overcoming these barriers in the region. The importance of active involvement of manufacturers was highlighted by country representatives, since adopting new specifications may require technology upgrades. IIEC is currently compiling DT market data from APEC economies and together with the inputs from the workshop, IIEC will conduct comparative analysis of the new IEC technical specifications against the existing energy performance standards or practices in each APEC economy taking into account diversity of load curves and seasonal variations. Recommendations for APEC economies regarding the method to best regulate energy performance in DTs to minimize uncertainty in energy saving benefits and drive technology improvements will be formulated based on the findings of the analysis. Workshop agenda and presentations can be downloaded [here].